“They turned me into a lion.” A parent organizer tells us about today’s mass student strike at Roots Academy. Facing the closure of their school, only 14% of Roots students came to class today. The rest are staying home to teach OUSD a lesson, and to flex their power ahead of the upcoming teachers’ strike. Ríos, whose son is a seventh grader at Roots, was a key organizer of today’s successful student strike. Of Roots’ 300 students, 259 stayed home today to protest the district’s decision to close the school and scatter its students. The decision was made at an emotional four-hour meeting on Wednesday, at which impassioned students, teachers, and parents from Roots defended their existence as a learning community to the school board, who then voted 6-1 to close the school, citing budget problems. Today’s strike hits OUSD’s bottom line pretty hard: the district receives $81 per day from the state for each student in attendance, so the community action is costing the district over $20,000. That kind of money speaks loud, according to Ríos. For everyone keeping faith that Roots and 23 other public schools can be saved from the chopping block, this strike is a prelude to the main event: the teachers’ strike likely to begin in a few weeks. If every parent in Oakland keeps their kids home during the strike, it will cost the district millions of dollars and force OUSD to give in to the teachers’ demands to keep Roots and the other 23 schools open, as well as to provide more services for students, higher teacher pay, and more special education supports. OUSD is already trying to weaken support for the strike by pitting teachers against families. They have claimed that the only way to pay teachers a living wage is to close more schools and make more cuts that will hurt students. But the Roots families won’t be falling for it, Ríos said. They know a successful strike is the last hope to keep Roots open and to defend public education from privatization, and keeping kids home is key to winning. “We are behind the teachers one million percent,” she said. “I won’t be sending my kid to school during the strike. We are holding to the light of hope that the strike will win, and the win will help Roots too. Of the 23 schools the district plans to close, none are in the wealthier Oakland hills. “They’re not targeting the rich with closures,” Ríos said. 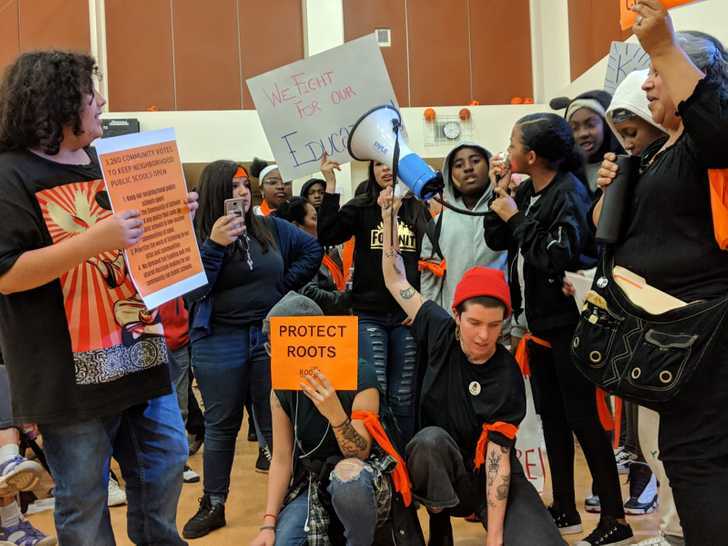 “They’re targeting us: the poor, the children that need the most.” Roots students are primarily African American and Latino and live in the same East Oakland neighborhood as the school. Ninety-five percent of Roots students receive free or reduced lunch. Despite what the district claims about cutting costs, the end goal of the closures is to reduce the number of public schools like Roots and to make space for more charters. Research has shown that closing schools doesn’t actually save money. The people who will actually save money on this deal are the billionaires who back school closures across the country, because replacing unionized public schools with non-unionized charter schools cuts rich peoples’ tax bills significantly – charter teachers frequently work for lower pay and benefits than public school teachers. In a city where charters already benefit from shady deals that hand them public property, including empty school buildings, any closure should be seen as a ploy to make room for more charters. These charters are then allowed increase their profits by refusing service to Oakland students, particularly those with the highest needs.